Using a plasma cutter and mig welder to create uniquely creative steelworks of art. PLANT SHELVES are a colorful way to create a wall of color. Each custom designed plant shelf can have any size holes cut into the shelf. The shelf will be sized in proportion to the pot it is to hold. 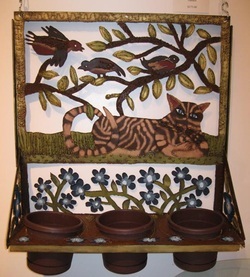 Commercial pots or one of a kind ceramic pottery can be securely held in this shelf. Themes range from playful creatures, sophisticated nature-scapes, or geometric shapes, these metal artworks will be a dramatic addition to garden or home. Structures can remain outdoors all year with out fear or ruining them! Select from existing works or have one custom crafted. SOLID SHELVES with a solid base offers more possibilities. Each can be constructed to display anything from candles to collections. Theme possibilities are endless, but most popular are nature-scapes and contemporary geometric designs. 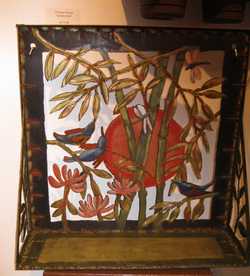 While this example is fully colored with gilderspaste, shelves can be left to naturally rust over time to a golden orange color. This shelf was designed for installation on the back side of a wooden fence. But additionally, shelves are at home indoors as well. Imagine the conversations around your CUSTOM MADE FIRE-PIT. 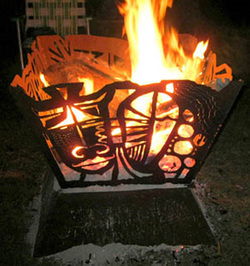 Plasma cut images ranging from tribal, geometric, nature, city or a special themed design of your own making can be featured on your custom made fire-pit. Sizes range from small to over-sized because I do the work myself! These fire-pits are usually left as bare steel, because of the heat generated by the burning logs. Add a cooking grate to the top of the pit, and you can roast corn on the cob or pop popcorn with your friends! SIGNS can be easily manufactured from steel sheet and rod. This sign was constructed for display indoors above a gallery wall. Areas in the shoes have been rusted and coated with clear paint to preserve the rust patterns. Metallic gilderspaste coloration offers a hand rubbed patina of copper, silver, bronze and golds. This sign was installed directly to drywall with toggles and bolts. It measures 42" square! 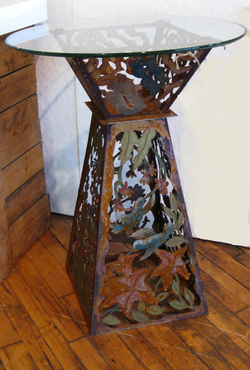 PLASMA CUT TABLES can have glass, wood, or metal tops. Gardeners are often looking for a unique piece to add to the landscape or patio which can safely remain outdoors all year. Tops are easily removed to make a plant stand! Pairs of bases can be constructed for a longer, larger table. This table is equally at home indoors! Tables of any height and width can easily be constructed to the buyer's needs. 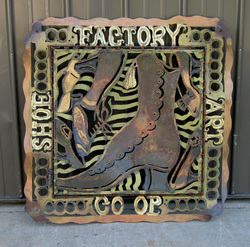 FINE ART flat steel "pictures" can be used for that special location. 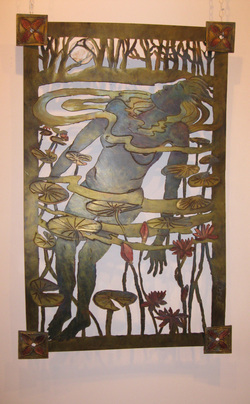 This steel artwork is meant to be installed above a pond, on a stone wall. Steel spacers and bolts will hold the steel away from the wall to add shadows and depth to the installation. Any subject matter is suitable for artworks on steel. Whether free drawn or projected, it is possible to create any image on steel. If 3-D elements can also be added to provide interest and texture. If in the sunlight or spotlight, the metallic gilderspaste color will add sparkle and richness to the surface. Gilderspaste resists fading and will remain bright and colorful.